The Port of Bremerton is poised to award a $1.97 million contract to extend its Cross SKIA Connector Road to Old Clifton Road. The low bidder for the project WHH Nisqually Federal Services, LLC., a tribally-owned enterprise based in Olympia. The company’s bid came in just under the engineer’s estimate for the work, according to a port staff memo. The port commission is set to approve the award at its Tuesday meeting. A breakdown of the bid is embedded below. The port received a $2 million allocation from Puget Sound Regional Council for this phase of the connector road, and budgeted $345,800 of its own cash. The existing connector road extends south off Highway 3 and runs along the east edge of Bremerton National Airport. Phase 2.1 will extend the existing connector road by about 3,000 to meet Old Clifton Road (click the inset map to enlarge it). Contractors will also build a roundabout to accomodate future road extensions. Work is expected to begin in June and be completed within 80 days. 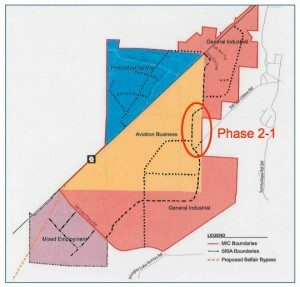 The port considers the connector road critical for encouraging growth in the industrial and aerospace acreage surrounding the airport. You can read its pitch to the Regional Council here (PDF). The area was previously called South Kitsap Industrial Area (SKIA), but was recently renamed Puget Sound Industrial Center-Bremerton (PSIC-B).